Charles Carden started working at Hi-Spot Bowling in 1947 and has owned the Roxborough mainstay since 1970. On February 28, 2018, the bowling alley will close its doors for the last time. Charles Carden had just spent the better part of two hours talking about the place where he's worked off and mostly on since the late 1940s, the last 47 years as owner. "Do you want video of me waving goodbye?" he asked moments after last Wednesday's senior-bowling league wrapped up its weekly morning roll. Carden took a couple steps out onto Lane Six at Hi-Spot Bowling, removed his eyeglasses with his left hand, raised his right and held it stationary. "I can't even put grape juice into the refrigerator with this hand," he explained. Among the injuries that put him in this predicament was a shoulder mishap that left doctors so concerned about whether he'd survive reparative surgery that they recommended he just live with it for the rest of his days. The second-to-last day-league session had just ended. The seniors – some with canes, others with wearing veteran hats, and all bowling for teams named after Atlantic City casinos – will roll their final frames on Wednesday. That's when the throw-back Roxborough mainstay – the lanes that were there before the streets around it were all paved – will close its doors forever. A bunch of developers bought it. They're not saying so publicly yet with any specificity, but the tannish-gray block of a building and the parking lot behind it – situated on a hill bowling distance from the drive-thru beer distributor on Ridge – will soon become housing. The Flats on Pechin is what the name on the sales receipts said. But oh, before they're gone, you should hear those peach-and-blue walls talk. The voices were channeled through an 83-year-old man – sitting at a laminate table in a place that time overlooked – who's forgotten more than you likely remember about life. Born in 1934, Carden is a Roxborough lifer who backs up his "hand to God, I have a really good memory" promise with impressive recall. 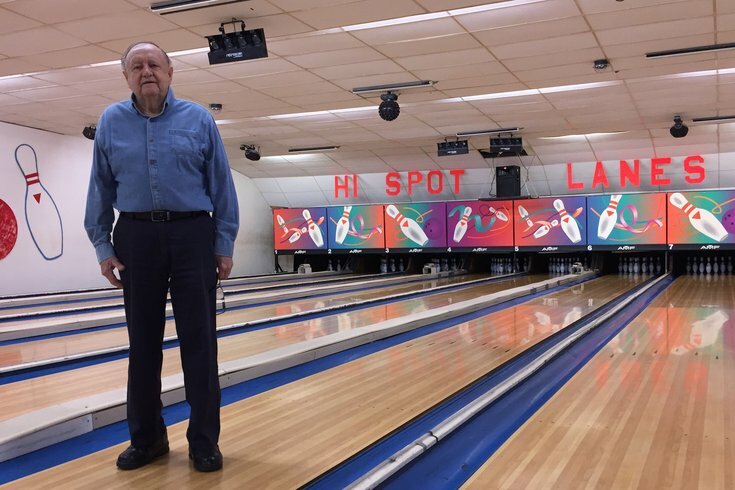 The oldest of six siblings – his four brothers and a sister have since died – he started setting pins at Hi-Spot in 1947, less than a year after it opened. He was a "pin boy" and his responsibilities included keeping the eight-lane alley clean. Back then, the streets that lead to Hi-Spot today weren't completely paved; the land where houses now stand down the Hermit Street block were built on land that was still "trees and everything." "I set pins six days a week in the winter and summer," he recalled of his days working for the original bowling-alley boss Andy Sienko. "We'd open at noon and I'd set pins until 12 or 1 a.m., or until 5 a.m. on Sundays. I fell asleep in class a lot." Carden parted ways with Roxborough High School during his senior year and enlisted in the Air Force, serving four years during the Korean Conflict. He planned to make a career of it. "It turned me into a real man," he said of his time in the service. "But then, I met the most beautiful girl in Manayunk and everything changed." He's talking about Marilyn, the wife with whom he recently celebrated a 60th wedding anniversary. She's sitting nearby with friends from the senior bowling league. She's friendly as can be but doesn't want to chime in for this story about Hi-Spot's impending closure. On February 21, 2018, the senior bowling league had its second-to-last ever competition at Hi-Spot Bowling in Roxborough. Love brought Carden back to the neighborhood permanently, as did a job as a truck driver. The couple had a son and daughter. "We paid it off in 10 years," he proudly shared. "I never made a dime here. Never got paid." 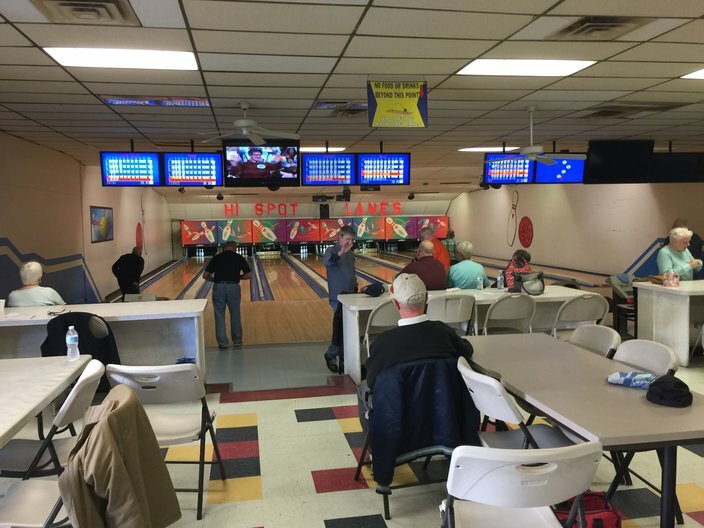 But it was a labor of love who saw fellow bowlers – and lifelong friends named Herman, Moose and Sam – chip in to "keep the place going" as smoothly as possible. "Really good friends. Like brothers," said Carden, who nearly lost his life in a 1957 car accident at Henry Avenue and Walnut Lane. He crushed some ribs, damaged his back and suffered a nasty concussion. "I was on my way out, but God said I don't want you yet!" They handled all the electrical, plumbing and construction issues; one bowler even installed the door facing the parking lot one night way back when. There were major renovations around 1980 and new lanes installed around 1995. "This place looked like a funeral parlor when it opened. Dark wood, dark lighting. But soon, it looked like a real bowling alley," he said. "I spent my whole life here, and it was worth it. I have the greatest friends in the world – both living and dead – because of this place. You could really write a book about it." As he scanned the room, it's easy to mourn for what he's about to lose until you remember that a physical demolition won't erase the memories built up over decades upon decades upon decades. Still, the decision to sell was difficult, and not just because of the neighborhood haters who say he should've sold it to someone who'd retain the bowling alley on the hilltop corner. The rigors of time had won. "I just can't take care of everything anymore," he said. When Hi-Spot closes its doors for good after business on Wednesday – the sale was finalized on December 15 – it will speak to a trend evident in the bowling world for years. Don't take that to mean that the bowling industry is going away. Quite the contrary: It's doing rather well across America. Frank DeSocio, executive director of the Bowling Proprietors Association of America, said the Hi Spot Lanes story is emblematic of what's happening to some "traditional" 8-to-10-lane alleys across the country, particularly in cities seeing an influx of "boutique" alleys. When developers show up at the door with big checks, it's hard for owners to say no. "We're losing some to real-estate value, but not as many as the perception is," he said. "What's happening with the smaller centers is the real-estate (offers) are too big of a play. There are many factors at play, but as a sport, it's as good as it's ever been." He estimated that 40 to 45 alleys closed last year which "is not a number that would make you say, 'Oh my!' Many of those needed to close." There's a city vs. heartland divide at play, too. "If you go to Pennsylvania, which has more bowling alleys than any other state in the country, traditional alleys serve as a community hub," he said. "It's a little tougher in a Philadelphia, where developers can offer a big chunk of money, but we're not seeing that in smaller towns. "Bigger towns are being served by new centers, but in small towns, the traditional lanes remain Americana." In many ways, Hi-Spot represents that Americana feel. With Yelp reviews both loving and deriding it, Hi-Spot even has a place in Sixers lore. It's allegedly the place where Sixers free-agent disaster Andrew Bynum aggravated a knee injury that left the center with a "did not play (injury - knee)" line for his 2012-13 season. 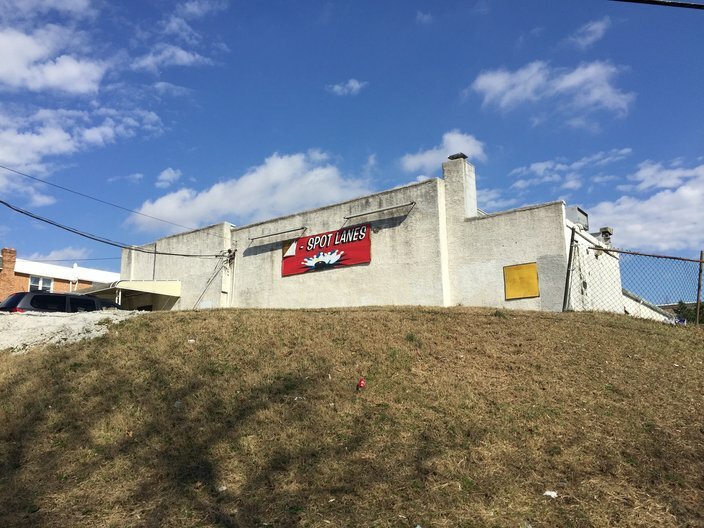 Hi-Spot Bowling, at the intersection of Pechin and Hermit streets, has been a staple of Roxborough life since the 1940s. Soon, it will be demolished to make way for residential development. A look at the city's bowling offerings matches DeSocio's analysis. Places like Hi-Spot are increasingly rare. The Polish alleys in Northeast Philly and St. Monica Lanes – a 12-lane alley in the basement of a church at 16th and Shunk in South Philly – most closely fit the bill. Vintage bowling alleys have a place in more than Philadelphia's nostalgic memories – the main bar at the new Yards Brewery's taproom was constructed from wood repurposed from bowling lanes – but the boutique lanes thrive. South Philly's PEP Bowl underwent major renovations that culminated in a 2005 reopening which celebrated its vintage feel. North Bowl opened its doors in July 2006, while South Bowl followed suit in February 2015. Then, in September 2016, Revolutions at Penn Treaty came along. A cursory online search turned up 169 bowling alleys up for sale in the country. As for this particular sale, real estate records note that the property was listed with a $975,000 asking price on August 1, 2017. Philadelphia property records list the sales price at $700,000 on December 14. Carden doesn't want to get into the financial specifics, though, other than saying there were some zoning-related complications. The owner is listed as Flats on Pechin LP, a limited partnership filed on October 23, 2017. The principal on record for that group is Andrew Langsam, a developer with local ties. He told PhillyVoice that he "threw a couple dollars in" for the group purchase, but noted that future plans have not yet been formalized. "No decisions have been made on that yet. Another big project is being wrapped up, and we will decide from there," he said, noting that the group saw an opportunity to improve the location while recognizing its vintage appeal. "I'm a neighborhood guy. I used to bowl there. It's a great place," he said. "I wish there was a way to do something else with it, but there's no way the neighborhood would let it get a liquor license there. Without a liquor license, no way to make it a lucrative business opportunity." Speaking of vices, Carden notes that he could've gotten a liquor license on the cheap decades ago, but opted against it. His insurance would've gone up tenfold, he estimated. He's not a big fan of drunks, saying that there's only been a dust-up or two inside over the years. Heck, he hasn't smoked a cigarette since his friend Pat walked up to him outside Hi-Spot, told him he'd been diagnosed with cancer and crumpled up his pack of L&Ms without warning. "He saved my life," Carden said of that three-decade-old memory. That's not to say the place is booze-free, of course. People who rent Hi-Spot out for parties are (well, were) allowed to bring their own. Then there was the time, some 40 years ago, when Carden got hauled before a judge for discretely selling bottles of beer inside. "The judge asked me if we were selling Michelob for 50 cents," he said, adding that he admitted to that transgression. "Then he said, 'Case dismissed and I'm coming up to your place once I'm done here today.'" Carden could go on with the good memories – sprinkled with some bad ones inherent in outliving most of your friends and loved ones – for hours, but in the bowling alley that's played a major role in his life the sands have just about filled the hourglass. He's already sold off most of the equipment, so that'll be gone after Wednesday's bowling. A regular is talking about giving the bowling shoes to the homeless in need of footwear. 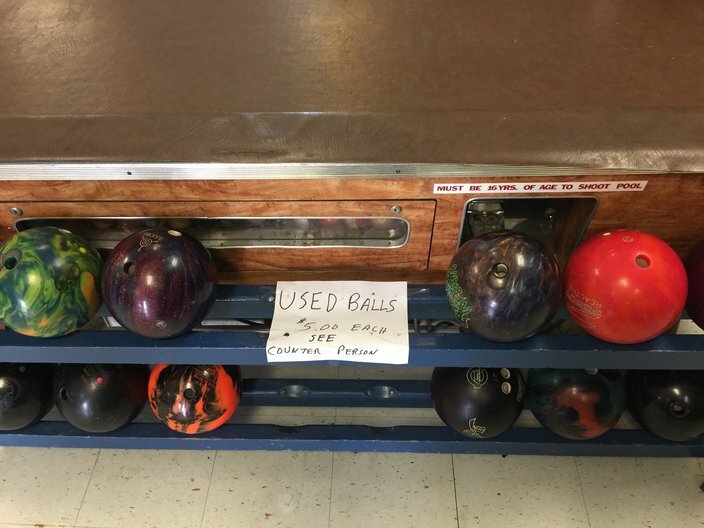 Fewer than a dozen bowling balls sit on the rack with the $5 sale sign. Much of the bowling equipment and accessories from Hi-Spot Bowling lanes in Roxborough has been claimed by bowlers or other alleys. At least one bowling painting has already been removed from the walls. "We're giving a lot of stuff away," Carden said. "I don't want it to just be junked." Thinking back to his years here, and the uncertainty of what lie ahead, Carden said that God has been nothing but good to him. It's time to focus on himself and his family. "I ain't in good shape," he said with a tone of resignation that makes it easier to accept. "I pray that I live long enough to have some enjoyment. I've had a great life and met the greatest people and some of them are here now." After the final bowling session on Wednesday, the senior league will roll along at Facenda Whitaker Bowling Alley about 12 miles away. Hi-Spot was a goldmine, but it's not that anymore. Carden needn't look further than the empty slots on the league board for confirmation. Asked if he'll miss it, he offers a one-word answer – "No." "I've done everything in life than you can do," he said. "So much of my life when into this place. I've given everything I can give."